Kildare Nationalist — Bowled over! 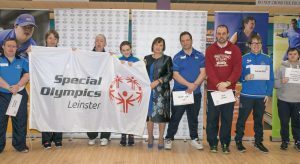 THE Special Olympics Leinster bowling competition got underway in K Bowl in Naas last week. Over 200 athletes took part from across Leinster with winners going on to represent against other provinces. Members of the gardai, hurling heroes and local politicians all went along to support the event and cheer on the local teams. Gardai Mark Ryan and Gary Cogan helped out Kildare hurlers Bernard Daly and Diarmuid Cahill as well as Aoife Reilly and Derek Gallagher from Special Olympics Ireland at the tournament. Special Olympians from all over Leinster were presented with their medals by Cllr Anne Breen. Local TD Fiona O’Loughlin had the honour of launching the event. “I was delighted to be asked and to see the athletes show off all the skills they have developed in bowling,” she said.